Fans of platform games have been really lucky in the last couple of weeks, with the sublime Jazz: Trump’s Journey receiving a score of 90%, and Lost Winds and Run Roo Run! also earning high praise from us. 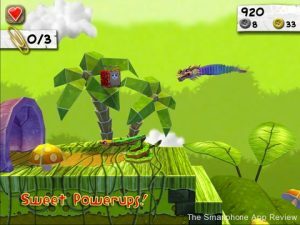 So, does Paper Monsters for iPhone deserve a place alongside Jazz: Trump’s Journey, or does it fall paper flat? 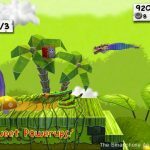 Thankfully, Paper Monsters is an excellent platform game. 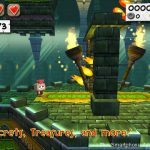 It may not be quite as special as Jazz, but that doesn’t stop it from sitting in the upper echelons of iPhone platform games, something that is great news for iPhone platform gaming in general. The first thing that will strike you about Paper Monsters is the absolutely fabulous graphical style. Looking like a mish-mash of Paper Mario, Cubivore and Cordy, the game still manages to have it’s own unique flavour to the mix. The main character inhabits a papery, 2.5D world that is as inventive in it’s stylings as it is pleasing on the eye, with all the enemies showing a startling level of imagination from the designers. In short, they all look like a bunch of Origami creations brought to life. It really is a joy to look at. The presentation is superb, with pop filled, jaunty tunes and a fast and responsive menu system that manages to be attractive and usable at the same time. You can even dress up the main character with a whole variety of costumes. The game plays really well, and like Jazz, it is fun just to jump around, with your avatar really feeling under your control at all times. The gameplay is actually of the fairly standard double jump variety, but as I said the developer have got the feel spot on, to the extent that most of the deaths are usually your own fault; no blaming the controls here. You hop around, exploring the levels, which all have secret areas to find and a set amount of collectibles to find. The paper clips are the main target, and some of them have been fiendishly well hidden, and half the fun of the game will be in finding them. I really liked the parts where you can warp to the background of the stage, with the camera staying zoomed out, in a similar style to Paper Mario. There also some fun power-ups to be found. There are some ace bonus sections where you jump into a submarine or fly around in side scrolling shooter environments. These sections really help to add a bit of variety to the package, and it is something that I would like more developers to do. If there is a fault, it is that there is not a lot of genuinely new gameplay elements. You won’t really be doing anything that you haven’t done in other games, but the game manages to still feel fresh. This is because of the quality of the gameplay and the beauty of the graphics, not to mention some really well designed stages. The game is a bright and breezy jaunt from start to finish, and there is a fair bit here to keep you going. I must say that the jumping sound effect does start to grate after a while, although the rest of the soundtrack is very impressive. In addition to the main story, which features some impressive bosses and differing gameplay styles, there is the option of customising the main character, a very welcome high score rush mode, Game Center integration and more. It all adds up to a full and well rounded package that will satisfy platforms fans. There is even the promise of more levels to come. Overall, this is a high quality platform game that, while not trying anything too groundbreaking gameplay-wise, is still a playable and enjoyable romp. The graphics are just gorgeous, and there is enough content here to justify a purchase. 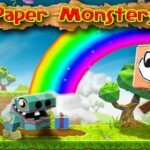 A great trip around a papery world, Paper Monsters is yet another addition to the list of quality iPhone platformers.